Everyone dreams about a Justin Bieber and Ariana Grande romance. They’re both superstars, they’re the same age and they’re both out-of-this-world-cute. 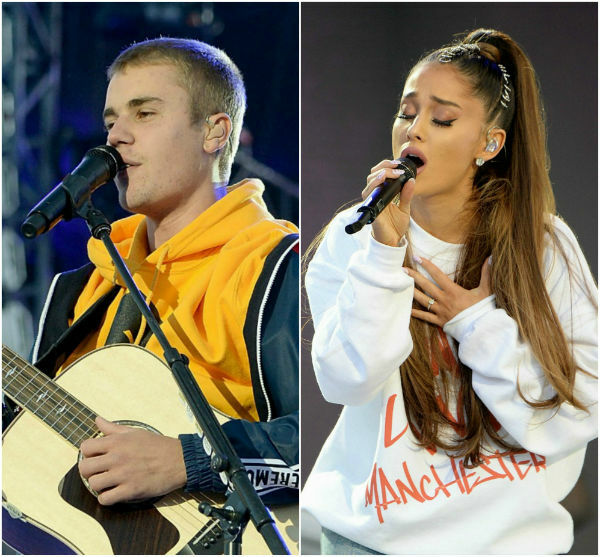 Ari and Biebs would totally make the perfect couple – the type we can only dream of. I mean, can you imagine their babies? A photograph of Justin and Ariana kissing broke the internet in 2013, causing major speculation. Perhaps our two faves finally found love. Nope. Ariana cleared the air and broke our hearts when she said the kiss meant nothing. She did get “shy” over it, though. Even if Ariana had a crush on Bieber at the time, things never progressed. Justin simply suggested to take a selfie together after he met Ariana’s grandparents at a meet-and-greet. The Dangerous Woman was hesitant in sharing the snap at the time because she didn’t “want the drama that comes with it”. Arianators and Beliebers lost their minds when their faves were spotted in a studio. Justin teased an upcoming duet with Ariana on Instagram but once again, the love never flourished. Ariana told the Associate Press that they’ll “finish it and put it out one day, but it just wasn’t the right time”. See Also: Get your hands on some Justin Bieber merchandise to truly call yourself a Belieber! An Ariana Grande and Justin Bieber love story hit headlines in 2015 when the duo got up, close and personal during her Honeymoon tour. The Purpose singer couldn’t keep his hands off the pint-sized powerhouse while performing a few of their hits together. Wrapping his arms around her waist, running his hands up and down her body – it sure looked like Ari and Biebs had some chemistry! It’s always a good sign when your crush enjoys your music. Ariana promoted Justin’s single, What Do You Mean in August 2015, proving once again that the couple were perfect for each other. This had nothing to do with the fact that Ariana and Justin share the same manager, nothing at all (we kid). In late 2015, Ariana and Bieber blessed our ears with a gorgeous duet – it’s about time! Their remix of What Do You Mean made Jarianators wish even harder for a possible fling. If music can’t bring them together, what will? After Ariana stopped working with Justin’s manager, the Sorry singer threw shade at her by sharing the stage with her ex, Big Sean. According to a HollywoodLife source, “Justin had the most amazing time performing with Big Sean and will without a doubt invite him back on stage during his Purpose tour. Justin will continue to surprise fans at his concerts with specials guests. However, Ariana Grande won’t be one of them,” OUCH! There was hope for an Ariana Grande and Justin Bieber relationship again in mid-2016 when Justin complimented Ariana’s music. “Bumping that new Ariana!! This song is dope as f***,” Justin captioned a pic of her latest single Be Alright. We love these shout-outs! It looks like Bieber gave Ariana’s hit, Thank U Next his seal of approval! Upon the release of her new track in November 2018, Justin tweeted Ari this kind message, dubbing the song “a bop”. C’mon guys, hook up – you know it makes sense. It’s pretty obvious Justin’s got a crush on Ariana. Why can’t she just let him love her? It’s about time they made us Jarianators happy. Arianator and Belieber fandoms would have a collective meltdown!